Background and objectives For accurate measurement of pH, urine collection under oil to limit the escape of CO2 on air exposure is recommended. This study aims to test the hypothesis that urine collection under oil is not necessary in acidic urine in which bicarbonate and CO2 are minor buffers, because loss of CO2 would have little effect on its pH. Design, setting, participants, & measurements One hundred consecutive random urine samples were collected under oil and analyzed for pH, pCO2, and HCO3− immediately and after 5 minutes of vigorous shaking in uncovered flasks to allow CO2 escape. Results The pH values in 97 unshaken samples ranged from 5.03 to 6.83. With shaking, urine pCO2 decreased by 76%, whereas urine HCO3− decreased by 60%. Meanwhile, urine baseline median pH (interquartile range) of 5.84 (5.44–6.25) increased to 5.93 (5.50–6.54) after shaking (ΔpH=0.12 [0.07–0.29], P<0.001). ΔpH with pH≤6.0 was significantly lower than the ΔpH with pH>6.0 (0.08 [0.05–0.12] versus 0.36 [0.23–0.51], P<0.001). Overall, the lower the baseline pH, the smaller the ΔpH. Conclusions The calculation of buffer reactions in a hypothetical acidic urine predicted a negligible effect on urine pH on loss of CO2 by air exposure, which was empirically proven by the experimental study. Therefore, exposure of urine to air does not substantially alter the results of diagnostic tests for urine acidification, and urine collection under oil is not necessary. Depending on the state of the acid–base equilibrium of the body, the range of urine pH varies widely from 4.5 to 8.0 (1). In general, the average urine pH on a regular average diet ranges between 5.0 and 6.5. Urine pH depends mainly on the concentration of bicarbonate; the higher the concentration of bicarbonate (HCO3−), the higher the pH. When a urine sample containing a high concentration of bicarbonate is stirred, allowing CO2 to escape, its pH increases sharply. Similarly, a reduction in the pCO2 of blood causes a sharp increase in pH. The large increase in pH with the reduction in pCO2 is attributed to the fact that bicarbonate and CO2 are the predominant buffers in both situations. Because of these experiences, it is generally assumed that a change in pCO2 would have a large effect on the pH of any fluid, including acidic urine. The generally accepted criterion for the diagnosis of type I renal tubular acidosis (RTA) is the inability of the kidney to reduce urine pH to below 5.5 on acid loading or after the administration of a loop diuretic (2,3). If a reduction in urine pCO2 had a substantial effect on urine pH, the prevention of CO2 loss before the measurement of urine pH would be of paramount importance; otherwise, it could easily mislead the diagnosis. For example, a person who is able to acidify urine normally by reducing the pH to 5.3 on acid loading could be mistakenly labeled as a case of type I RTA if CO2 escape had resulted in a rise in urine pH to greater than 5.5. To avoid artificially high urine pH, it is a common practice to collect urine under oil to prevent loss of CO2. Although the loss of CO2 from alkaline urine has been shown to cause noticeably higher urine pH in oil-unprotected urine samples, reports about urine pH changes in acidic urine (pH<6.0) after air exposure are rare (4,5). In a solution such as urine that contains multiple buffers, the main determinants of pH are the dominant buffers. At urine pH under 6.0, the bicarbonate/CO2 buffer pair would be a minor player in the overall determination of urine pH (6). Therefore, the fact that a substantial increase in pH occurs in alkaline urine on exposure to air cannot necessarily be extrapolated to acidic urine. Thus, this study was undertaken to test the hypothesis that a substantial reduction in urine pCO2 by allowing free escape of CO2 would have a negligible effect on the pH of acidic urine, and therefore, it is not necessary to collect urine under oil, even when accurate measurements of urine pH are needed. The study protocol was approved by the Institutional Review Board of Hanyang University Guri Hospital, Guri, Korea. Samples of approximately 50 ml random (untimed) fresh midstream urine were collected in sterile urine containers layered with paraffin oil (approximately 10 mm in depth) from 100 healthy male volunteers (age=25–71 years). Two 10-ml oil-free aliquots were obtained from each sample using a plastic syringe with an 18-gauge needle while carefully excluding air bubbles. One aliquot was used to measure pH, pCO2, and HCO3− within 5–10 minutes of voiding, the latter being calculated from pH and pCO2 using the Henderson–Hasselbach equation. The other aliquot was transferred to a 250-ml open flask, shaken vigorously at 140 rpm for 5 minutes in a shaking machine at 25°C, and used to repeat the measurements. We carried out a pilot experiment to determine the appropriate duration of shaking by measuring CO2 loss and change of pH at intervals by 5 minutes, with measurements at 0, 5, 10, 30, and 60 minutes. The experiment revealed that loss of CO2 was maximal by 5 minutes with no additional notable changes. Urine pH was repeatedly measured to two decimal places until the desired reproducibility of ±0.02 pH units was obtained to minimize random measurement errors. The measurements were made using a pH meter with a glass electrode (model 420A; Orion, San Francisco, CA). The machine was calibrated every 1 day using three pH standards (4.01, 7.00, and 10.01). Urine pCO2 was measured using a blood gas analyzer (Nova, Waltham, MA) with a measurement range of 3–200 mmHg. Data were analyzed with SPSS version 18.0 for Windows (Chicago, IL). Because the data were not normally distributed, the Mann–Whitney U test was used with the Wilcoxon or Friedman test as appropriate for least significant differences. Correlations between variables of interest were analyzed by bivariate correlation (Pearson correlation coefficient) or Spearman correlation. Data were expressed as median with interquartile range. P values<0.05 were considered to indicate statistically significant differences. Of the 100 consecutive random oil-free urine samples obtained from healthy male volunteers, 97 had pH<7.0 (range=5.03–6.83), whereas 3 had pH>7.0 (range=7.04–7.15). Of the samples with pH<7.0, 28 had pH≤5.5, 35 had pH=5.5–6.0, 22 had pH=6.0–6.5, and 12 had pH=6.5–7.0. After shaking of urine, urine pCO2 decreased from 47.3 (37.2–62.7) to 12.0 (10.3–15.0) mmHg (a 76.4% reduction); ΔpCO2 was 35.4 (24.8–50.0) mmHg and highly significant (P<0.001), and it resulted in a reduction in pCO2 to a value close to one-quarter of the original. If there had been no change in bicarbonate concentration, the pH would have increased by 0.6 pH units. However, urine pH increased only from 5.84 (5.44–6.25) to 5.93 (5.50–6.54; ΔpH=0.12 [0.07–0.29], P<0.001), because urine [HCO3−] decreased from 0.75 (0.26–2.41) to 0.23 (0.10–0.91) mmol/L (Δ[HCO3−]=0.48 [0.15–1.15] mmol/L, P<0.001) (Table 1). Although this decrease in urine bicarbonate concentration was small in absolute terms, it represented a decrease of 60.4% from the baseline value, and it was largely responsible for preventing a large increase in urine pH. When urine samples with baseline pH≤6.0 (group I, n=63) and samples with baseline pH>6.0 (group II, n=34) were compared, their final urine pCO2 values obtained with shaking were similar (12.1 [10.2–15.4] versus 11.7 [10.2–14.4] mmHg, P=0.73), but the ΔpH in group I of 0.08 (0.05–0.12) was much less than the ΔpH in group II (0.36 [0.23–0.51], P<0.001). The smaller increase in urine pH in the former is explained by the greater proportional decrease in urine bicarbonate concentration (64.2% [55.9%–73.5%] versus 52.1% [33.4%–64.6%], P<0.001). The absolute decrease in bicarbonate concentration in the former of 0.19 (0.12–0.49) mmol/L was much less than the absolute decrease in the latter of 1.43 (0.86–2.53) mmol/L, but it is the relative change in bicarbonate concentration that affects urine pH (Table 1). Because the proportional change in urine bicarbonate concentration after shaking was much greater in the urine with a lower pH, ΔpH in the subgroup of samples with baseline pH≤5.5 (n=28) was negligible at less than 0.1 (ΔpH=0.06 [0.02–0.07]). Urine pH after shaking was strongly correlated with the corresponding baseline pH (r=0.99, P<0.01) (Figure 1). As urine baseline pH increased, the regression line diverged more from the line of identity. The data points for urine samples with baseline pH≤5.5 (n=28) were almost all superimposed on the line of identity, with only four of their values deviating from the line, but the deviation was all less than 0.1. Correlation between urine pH after CO2 loss because of shaking and the corresponding baseline pH in oil-free acidic urine samples (n=97). The dotted line at pH 5.5 shows the changed urine pH values almost close to the line of identity at or below urine baseline pH 5.5, with only 4 of 28 samples with pH minimally greater than 5.5. The absolute increase in urine pH after shaking was also positively correlated with urine baseline pH (r=0.84, P<0.01) (Figure 2). The graph of the relationship between these variables is a reversed parabolic curve, pointing to a tendency for smaller increases in urine ΔpH after CO2 loss to occur in urine samples with lower urine baseline pH. For samples with baseline pH≤5.5 (n=28), ΔpH was <0.1. For samples with baseline pH=5.5–6.0 (n=63), ΔpH was <0.3. For samples with baseline pH=6.0–7.0, ΔpH was ≤0.65 in all except one sample, which had a ΔpH=0.8 (Figure 2). Correlation between the urine ΔpH after CO2 loss because of shaking and the corresponding baseline pH in oil-free acidic urine samples (n=97). Dotted lines at pH values of 5.5, 6.0, and 7.0 reveal the degree of urine ΔpH by 0.1, 0.3, and 0.65, respectively. 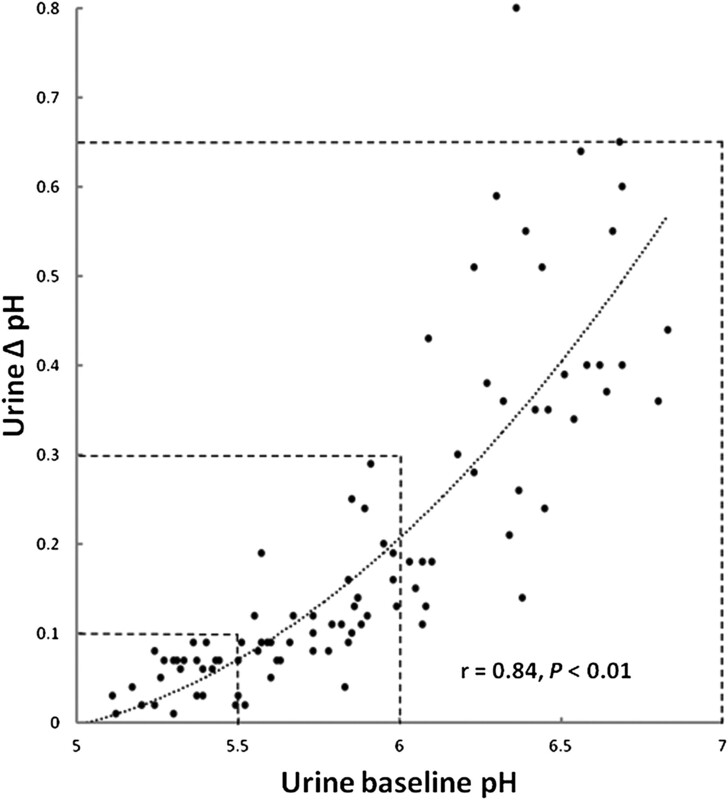 This study shows that urine samples with pH under 7.0 (n=97) exhibit a minimal increase in pH from 5.84 (5.44–6.25) to 5.93 (5.50–6.54; ΔpH=0.12 [0.07–0.29]) on exposure to air, despite substantial loss of CO2. In particular, in samples with pH≤5.5, the increase in urine pH on loss of CO2 was virtually nonexistent. This finding suggests that, unlike the situation for alkaline urine (pH>7.0), collection of urine under oil is unnecessary for acidic urine, even when accurate measurements of urine pH are desired. A common clinical condition that demands the documentation of acidification status of the kidney is type I RTA, which is diagnosed when urine cannot be acidified to a value below pH 5.5 on acute acid loading or after the administration of a loop diuretic (2,3). If exposure to air resulted in a substantial rise in urine pH (for example, from 5.3 to a value greater than 5.5), a misdiagnosis would be a likely outcome (2,7,8). In the present experiment, after the air exposure with vigorous shaking, all 26 urine samples with baseline pH<5.5 remained below 5.5, except three samples with baseline pH values between 5.4 and 5.5 (5.43 to 5.5, 5.44 to 5.51, and 5.49 to 5.51). Even in these instances, the actual change in urine pH in every case was less than 0.1. The likely increase in urine pH of samples collected without oil is expected to be even less than what we observed, because urine pH measurements are not usually made after shaking the samples for 5 minutes. Only a few previous studies have described the relationship between the change in urine pH and the loss of dissolved CO2 during storage (4,5,9). These studies, which mostly used alkaline urine samples (pH at or more than 7.0) after in vivo or in vitro alkalinization, showed that collection of urine under mineral or paraffin oil and storage of urine in sealed plastic syringes at 4°C were effective in preventing the escape of CO2. No previous studies have shown that collecting urine under oil is unnecessary in acidic urine. This study provides empirical support for the hypothesis that loss of CO2 in acidic urine (urine pH≤6.0) has a negligible effect on urine pH. This prediction was based on the buffer reactions expected in acidic urine of known buffer composition: the bicarbonate/CO2 buffer is expected to play a minor role in determining urine pH in acidic urine, and in very acidic urine (pH≤5.5), it is expected to have virtually no role at all. Normal urine contains multiple buffers. Urinary buffers that have important influences on urine pH include NH3/NH4+ (pK=9.4), HCO3−/CO2 (pK=6.1), HPO4=/H2PO4− (pK=6.8), urate/uric acid (pK=5.5), and creatinine/creatinine+ (pK=5.0) (10,11). In a solution containing multiple buffers, the isohydric principle dictates that all buffer pairs in solution must be in equilibrium with the prevailing pH of the solution and also, the pK of the individual buffer pair. When a disturbance is introduced into one buffer system, the ratios of all other buffers in solution must be readjusted with the new pH. The normal excretion rates of HPO4=/H2PO4−, urate/uric acid, and creatinine are approximately 30 mmol/d, 3 mmol/d, and 13 mmol/d, respectively (12). For these three buffers, the ratio of the alkaline buffer to the acid buffer changes with changing urine pH. Ammonia is present in substantial amounts in normal urine. The excretion rate of ammonia varies with body acid–base status; it is greatly increased in acidosis and reduced in alkalosis (13). However, the role of ammonia as a buffer when the pH is below 7.5 is negligible because of its very high pK (9.4). The concentration of bicarbonate in the urine depends mainly on urine pH. As urine pH decreases, the concentration of HCO3− in the urine decreases exponentially, because the urine pCO2 remains more or less constant. At a urine pH of 6.1, the expected bicarbonate concentration with a pCO2 of 40 mmHg is 1.2 mmol/L, and at pH 5.5, it is 0.3 mmol/L. At a urine pH between 6 and 7.5, phosphate is the dominant buffer, whereas creatinine is the dominant buffer when urine pH is below 5.5. Uric acid plays some role in buffering when urine pH is around 5.5, but because of its low total content (3 mmol/d), its influence is usually quite minor. Because the bicarbonate concentration is so low in acidic urine, a decrease in urine pCO2 should not cause a large increase in urine pH. Urine pH cannot be dictated by the bicarbonate/CO2 buffer in acidic urine; other buffers, such as phosphate and creatinine, are dominant. In very acidic urine, the bicarbonate concentration is so low that a decrease in pCO2 would be accompanied by an almost proportional decrease in bicarbonate concentration in a reaction with other urinary buffers. At a urine pH of 5.5 and pCO2 of 40 mmHg, for example, the concentration of bicarbonate is 0.3 mmol/L (5.5=6.1+log 0.3/[40×0.03]). If pCO2 were to decrease from 40 to 4 mmHg (1/10 of the initial value), the pH would remain unchanged when the HCO3− concentration also decreased to 1/10 of its initial value (namely, 0.03 mmol/L). Because the concentrations of other urinary buffers are so much higher at this pH than the concentration of bicarbonate, such buffer reactions would cause the almost proportional decrease in urine bicarbonate concentration, mitigating the increase in urine pH. Of course, bicarbonate concentration would not decrease exactly to the same proportion as the fall in pCO2, because the pH must increase slightly to initiate the buffer reactions. However, when the bicarbonate concentration is very low, the actual rise in pH needed for the buffer reaction to occur is negligible. In the example shown in the appendix, a calculation is made to show how a solution containing 30 mmol HPO4=/H2PO4− buffer and bicarbonate/CO2 buffer at a pCO2 of 40 mmHg and a pH of 6.1 would react when the pH of solution is altered by a decrease in pCO2 from 40 to 4 mmHg. The calculation shows that the pH change would be only 0.1 pH units, whereas without the participation of the phosphate buffer, the pH would have increased by 1.0 unit. The expected change in pH would be even smaller if the starting pH is ≤5.5. At such pH values, the influence of phosphate buffer in preventing urine pH changes will be waning, but other buffers such as uric acid and creatinine will become more dominant; the actual buffering needed to prevent a change in urine pH is far less at pH=5.5 than at pH=6.1, because the starting bicarbonate concentration is much lower at pH=5.5. The concentration of CO2 in the atmosphere at sea level is about 390 ppm, which is equivalent to a pCO2 of approximately 0.3 mmHg. The total CO2 content of urine at pH=5.5 and pCO2 of 40 mmHg is 1.5 mmol/L (CO2 concentration of 1.2 mmol/L and HCO3− concentration of 0.3 mmol/L). Thus, if the entire CO2 content of the urine is dispersed into an air space that is 25 times larger than the volume of the urine sample, the expected final urine pCO2 is less than 1 mmHg. It is, therefore, unclear why we were not able to reduce urine pCO2 to much below 10 mmHg, despite vigorous agitation. Nevertheless, the reduction in urine pCO2 that was less than expected must have contributed to a smaller increase in urine pH on exposure of the urine to open air. However, calculations based on the actual likely concentrations of urinary buffers indicate that, even if urine pCO2 had decreased further to a level as low as 1 mmHg, the rise in urine pH would still have been negligible for the acidic urine. A limitation is that our study was conducted in normal subjects rather than subjects with type I RTA. However, we cannot think of any biochemical reasons why the urine of subjects with type I RTA would behave differently in in vitro settings from the normal urine. In conclusion, acidic urine (pH<6.0) has shown no clinically significant changes in urine pH after shaking, despite substantial loss of CO2. Furthermore, the lower the baseline pH of the urine, the smaller the change in urine pH after loss of CO2. Thus, at baseline pH<5.5, the change in urine pH after loss of CO2 was virtually nonexistent. In addition, calculations using mathematical formulas for buffer reactions in urine samples with arbitrarily chosen buffer contents also supported the hypothesis that the collection of urine samples under oil is not necessary for accurate pH measurements in acidic urine. According to the isohydric principle, urine pH = 6.1 + log HCO3−/H2CO3 (=0.03 × pCO2) = 6.8 + log HPO4=/H2PO4−. If an arbitrary urine sample has a pH of 6.1, a pCO2 of 40 mmHg with a HCO3− concentration of 1.2 mmol/L, and a total urine phosphate of 30 mmol/L, what will be the expected urine pH when the pCO2 decreases to 4 mmHg after CO2 loss? If urine contains no buffer other than CO2 and bicarbonate, pH increases by 1.0 pH unit. However, when the solution contains another buffer at a substantial concentration and a reasonable pK, there will be buffer reactions. If the urine contained a total of 30 mmol/L of phosphate at pH 6.1, the concentrations of HPO4= and H2PO4− would be 5 and 25 mmol/L (a ratio of 1/5), because the pK of phosphate is 6.8. If the pCO2 drops from 40 to 4 mmHg without any change in HCO3−, the Henderson-Hasselbach equation predicts a pH of 7.1 [pH = 6.1 + log1.2/pCO2 (4 × 0.03) = 6.1 + log(1.2/0.12) = 6.1 + log10 = 6.1 + 1 = 7.1]. However, the predicted pH on the basis of phosphate ratio above is 6.1, because 6.8 + logHPO4=/H2PO4− = 6.8 − 0.7 = 6.1. Obviously, one solution cannot have two different pH values. Therefore, the phosphate buffer system, being in disequilibrium with the new pH, will react with the HCO3−/CO2 buffer pair until the new ratio of HPO4=/H2PO4− and the new ratio of HCO3−/CO2 are both in equilibrium with the new pH. That is, by increasing the HPO4= concentration and reducing the H2PO4− concentration, the expected chemical reaction is the following: HCO3− + H2PO4−→ H2CO3 + HPO4=. As shown by this equation, the increase in HPO4= concentration is exactly equal to a decrease in H2PO4− concentration, which is also equal to the decrease in HCO3− concentration. Of course, the increase in H2CO3 concentration will be exactly equal to the decrease in HCO3− concentration. However, because CO2 is allowed to escape from the system, pCO2 is kept at 4 mmHg by the pre-set condition. The new equations will be as follows: pH = 6.1 + log (1.2 − χ)/0.12 for the bicarbonate and CO2 buffer system, and pH = 6.8 + log (5 + χ)/(25 − χ) for the phosphate buffer system, where χ equals the decrease in bicarbonate concentration, which equals the increase in HPO4=, as well as the decrease in H2PO4−. Because the two buffer systems are in equilibrium at the same pH, 6.1 + log(1.2 − χ)/0.12 = 6.8 + log(5 + χ)/(25 − χ). Solving the equation further, 6.8 − 6.1 = log(1.2 − χ)/0.12 − log(5 + χ)/(25 − χ); 0.7 = log(1.2 − χ)/0.12 − log(5 + χ)/(25 − χ). Because log a − log b = log a/b, 0.7 = log [(1.2 − χ)/(0.12)] × [(25 − χ)/(5 + χ)]. Because 0.7 = log 5, log 5 = log[(1.2 − χ)/(0.12)] × [(25 − χ)/(5 + χ)]. Now, the log can be eliminated from both sides: 5 = [(1.2 − χ)/(0.12)] × [(25 − χ)/(5 + χ)]. From the quadratic equation, χ2 − 26.8χ + 27 = 0, χ is calculated to be 1.04848. When this value is substituted in the original isohydric equation of final pH = 6.1 + log(1.2 − χ)/0.12 = 6.8 + log(5 + χ)/(25 − χ), the pH value is 6.2. In summary, if pCO2 decreases from 40 to 4 mmHg at pH of 6.1, the pH will increase to 7.1 in the absence of any other significant buffers. However, in the presence of phosphate buffer at a total concentration of 30 mmol/L, the pH will increase by only 0.1 units.